This installs the latest stable Drupal 7 release. Installing Drush for developing Drupal-site is a must-have for each developer. Drush is a command line scripting interface for Drupal. By using a lot of useful commands, you can interact with code like modules, themes, profiles. You can run update.php, execute sql-queries, clear the cache and a lot more! Since we can get started now with developing Drupal 8 sites it's necessary to have Drush 8 installed. 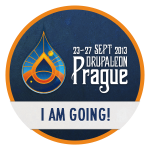 Drush 8 is compatible with Drupal 6, 7 and 8. Drush 8 needs PHP 5.4.5 or higher to be installed.